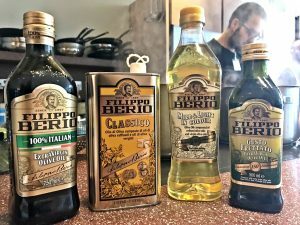 A Night in Tuscany with Filippo Berio and The Alberti Twins! 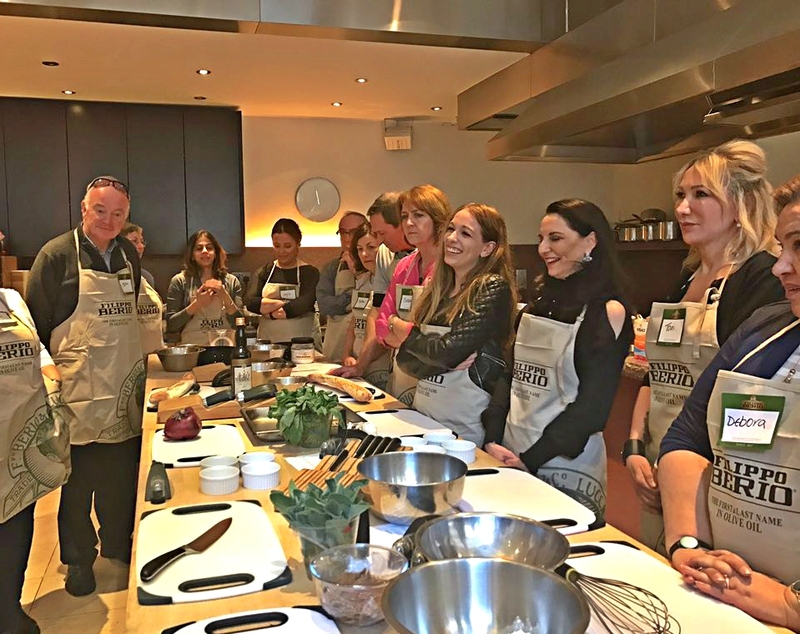 On Saturday 29th April, as part of our 150th anniversary celebrations we welcomed 20 Italian cuisine loving foodies, all willing to get their hands stuck into a Tuscan cookery class at La Cucina Caldesi cookery school in Marylebone. 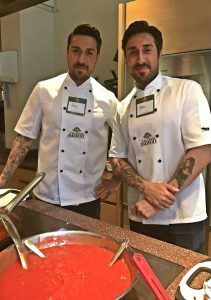 Our guest chefs for the evening, joining head chef Stefano Borella were Tony and John Alberti aka ‘The Italian stallions’ or Double trouble as we like to call them! The twins come from an Italian family based in Lucca, and have grown up around food and learnt to cook watching their parents and Nonna from an early age. 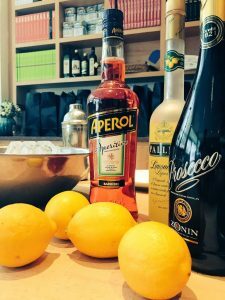 At La Cucina Caldesi, the twins were able to teach the guests how to prepare and cook some of the homemade recipes they share on their blog, and also currently as guest chefs on ‘The Today show’ in America. Tony and John welcomed guests to a reception of tomato foccacia, and Prosecco from our wine sponsor Zonin, Aperol Spritz and their very popular ‘Albertini cocktail’ made with Limoncello and Vodka- the perfect set up for the evening. After a brief introduction to the boys and chef Stefano, the twins began with a demonstration of their classic pomodoro sauce, and the key ingredient? Plenty of extra virgin olive oil to add and enhance the flavour of the tomatoes and all the fresh herbs. Tony (left) & John (right) about to demo their pomodoro sauce! Guests then got stuck in to preparing their delicious three course menu! To start, the guests made and enjoyed some ‘Salvia Fritta’ fried sage leaves with anchovies cooked in Filippo Berio mild and light olive oil. Although this appetiser is very popular all over Italy, it is known to originate from Tuscany. To follow, the guests prepared some delicious chicken liver crostini, along with Torta fritta served with pomodoro sauce, walnut pesto and fresh classic pesto accompanied by Rocca di Montemassi Calasole Vermentino from Zonin Wines. And then.. the main! The guests hard work paid off after shaping, rolling and cutting the potato gnocchi dough to create an Italian sausage and fennel ragu dish, with homemade potato gnocchi. The Castello di Albola Chianti Classico was a perfect wine pairing, selected by Zonin’s sommelier for the evening, Laura. 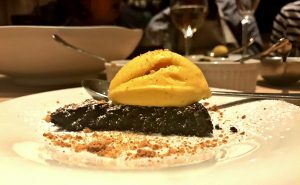 For dessert, the diners enjoyed one of the twins favourite desserts to make, their decadent chocolate and hazelnut olive oil cake, finished with ice cream and crumbled amaretti biscuits, served with Zonin Moscato Spumante. Belissimo! After the meal and espresso’s a plenty, some lucky guests were able to take home with them a bottle of the Zonin wine they had enjoyed during the meal, after coming top of the class in a quick quiz about Italian food, wine and of course Olive Oil! When the evening drew to a close, and all tastebuds were satisfied, guests were able to take home their goody bag, which included Filippo Berio Gran Cru gift set, a fab kitchen gadget from Oxo Goodgrips, a classic kitchen piece from Portmerion, Delverde pasta, Rio Mare Tuna and Truffle salt from L’Aquila. Not forgetting an Alberti t-shirt and letter especially from the boys! If you’d like to come to future events like this, make sure you sign up to the Filippo Berio mailing list to be the first to hear about them! Our next event, in celebration of our 150th year is on the 24th June with Carmela Sereno Hayes, and it’s a Pasta Masterclass! You can click here for more details and to secure your place.